So I was totally inspired by Teresa Kline's card below. Love the watercolor, love the heart. I love the design. I copied a few of the ideas from the card and made it my own. Thank you Teresa for the inspiration. So for the watercolor background I pulled out my Melon Mambo ink refill and Aqua Painter. 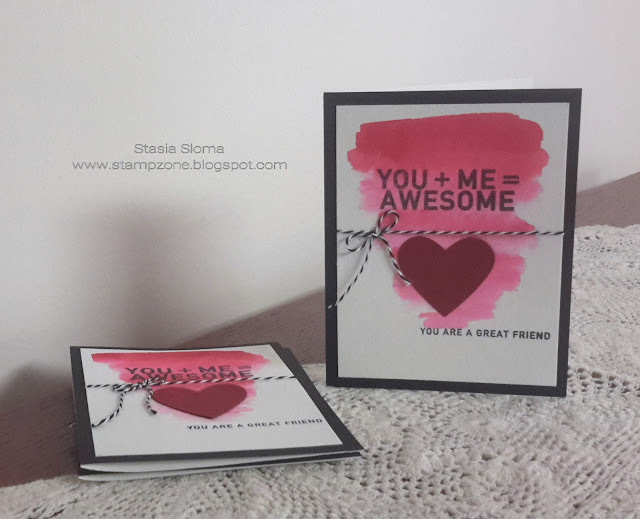 The heart was die cut with my Heart framelits and Cherry Cobber card stock The sentiment comes from the Simon Says Stamp You & Me stamp sets. Thank you again Tim Holtz for the your amazing platform which made stamping the sentiments so quick and easy.